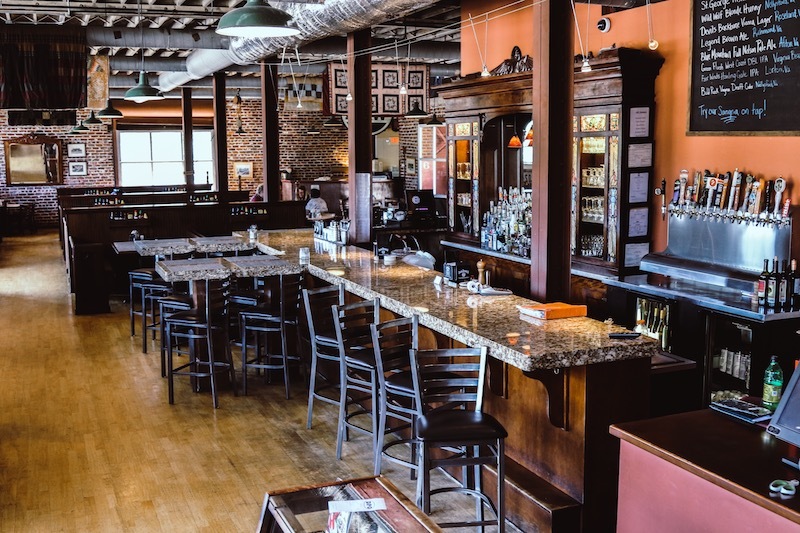 Lynchburg's historic riverfront is the perfect location for The Depot Grille. The large open dining area flooded with natural light is the ideal environment for a casual business lunch. The regular passing of trains just outside provides a wonderful treat for the kids. And the well-rounded menu of superbly cooked dishes is a treat for a family night out or impressing business clients. Our kitchen can be seen through the back windows of the dining room. Built in the 1960s, these two Georgia Northern Railroad freight cars were fully functional until their transformation. They were purchased in Marietta, Georgia where one had to have its brakes replaced specifically for the move to Lynchburg. 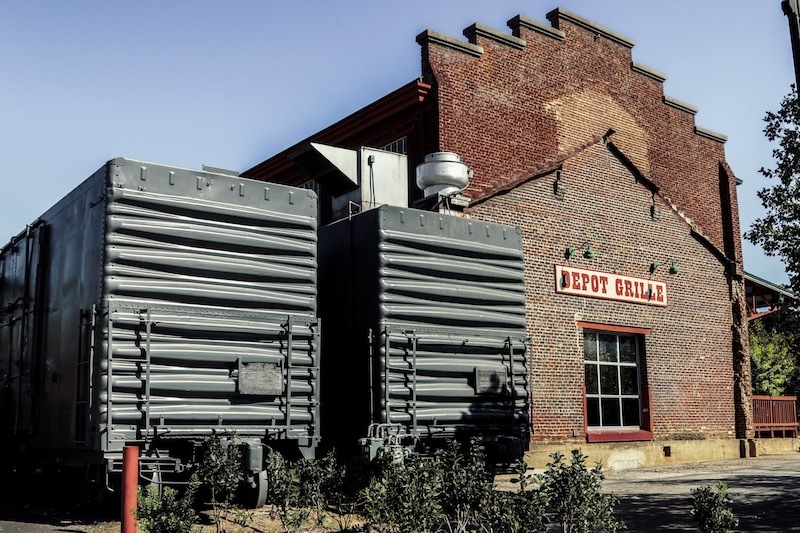 After being lifted by cranes from the railroad tracks to the back of the building, they were converted to The Depot Grille’s kitchen. 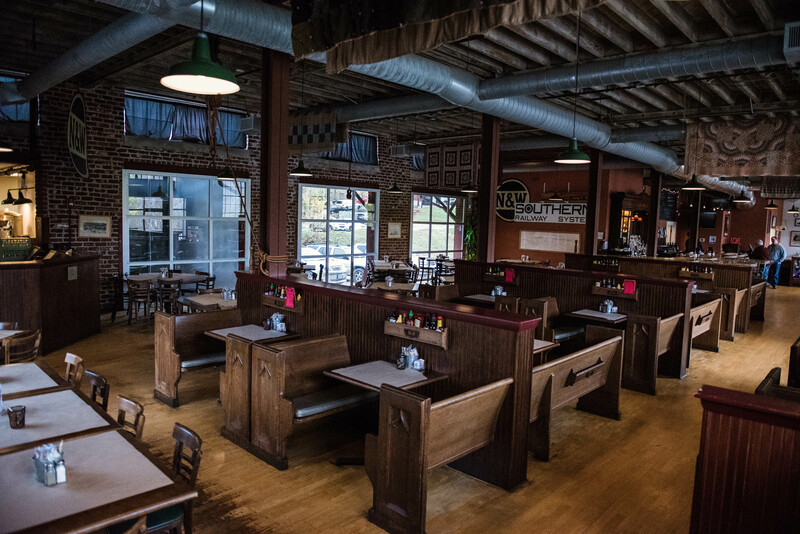 The booths are actually church pews from Grace Evangelical and Congregational Church in Allentown, Pennsylvania. The church was established in 1906 and has since been made into an antique store. A small private dining room within the Depot Grille decorated with antique railroad prints. This space is available for both lunch and dinner – It is ideal for a lunch or dinner meeting which requires privacy or intimacy. The recommended capacity for this room is 12 people or less. About the Model train on display at the Depot: Many of our guests comment on the beautiful hand built model train on display here. Mr. Fred Reburn has built twenty two models since 1985 and has kindly agreed to display his collection – Fred, who retired from the N&W after thirty two years, crafts each model from various wood over many hours. His choice of wood is interesting as Fred had a near fatal accident on Percival’s Island when he was impaled by a tree while riding on the footplate of a locomotive in 1979. Special thanks to Fred for sharing these unique models with us! 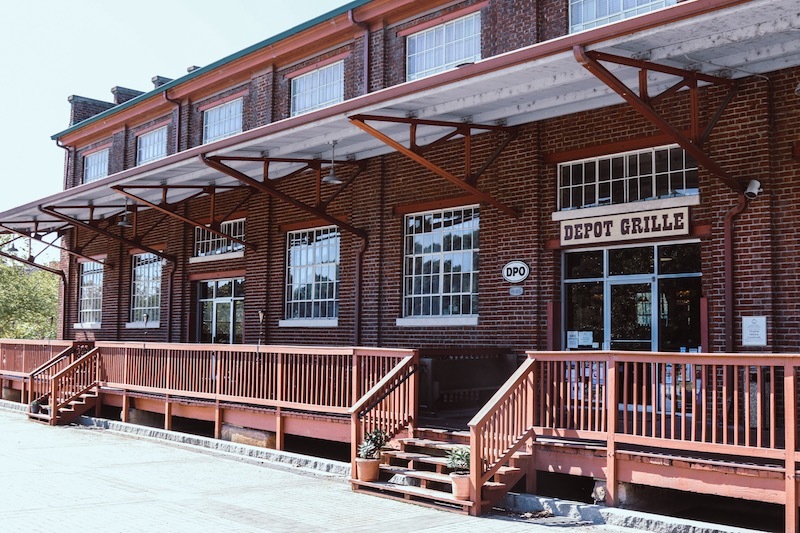 The Depot Grille welcomes applications between the hours of 2:00 and 4:00 pm. © 2017 The Depot Grille. All Rights Reserved.